Beautifully designed, this single-story home offers relaxed living amidst ultimate privacy throughout the 0.63-acre home site. Perfectly positioned at the end of a cul-de-sac, adjacent to beautiful Lake Nona, the 3,824-square-foot residence includes four bedrooms, four full and one half bathrooms. A gated courtyard entry with stone garden and water feature, welcome guests to an open floor plan that showcases high-end finishes, such as chiseled-edge travertine floors, European-style wood cabinetry and custom crown molding. A grand foyer with a volume ceiling leads into the formal dining area and adjacent formal living room accented by a large stone fireplace. The gourmet kitchen encompasses a center island, walk-in pantry and a breakfast bar which offers additional seating. Thoughtful details consist of Wolf and Sub-Zero appliances, granite countertops and a charming breakfast nook overlooking the family room, sparkling swimming pool and outdoor living area. French doors lead to an expansive master wing, highlighted by a breakfast bar, home organization center and private access to outdoor living area. The master bathroom, centered on a garden tub and walk-in shower, offers dual vanities and walk-in closets. 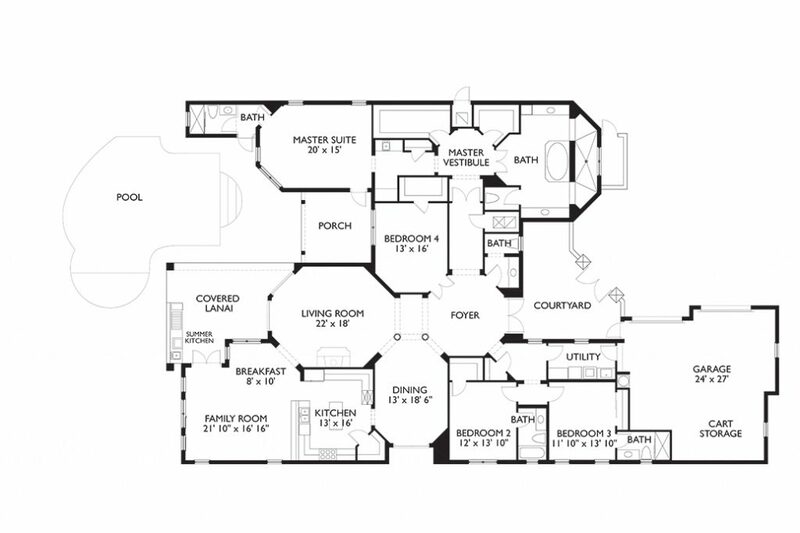 This favorable one-story floor plan includes two additional en suite bedrooms. The secluded backyard getaway, surrounded by well-manicured landscaping, comprises two covered lanais, a summer kitchen and a sparkling pool.